After two months of trying to negotiate an interview between the Michigan attorney general’s office and former interim MSU President John Engler, things hit the fan on Tuesday. 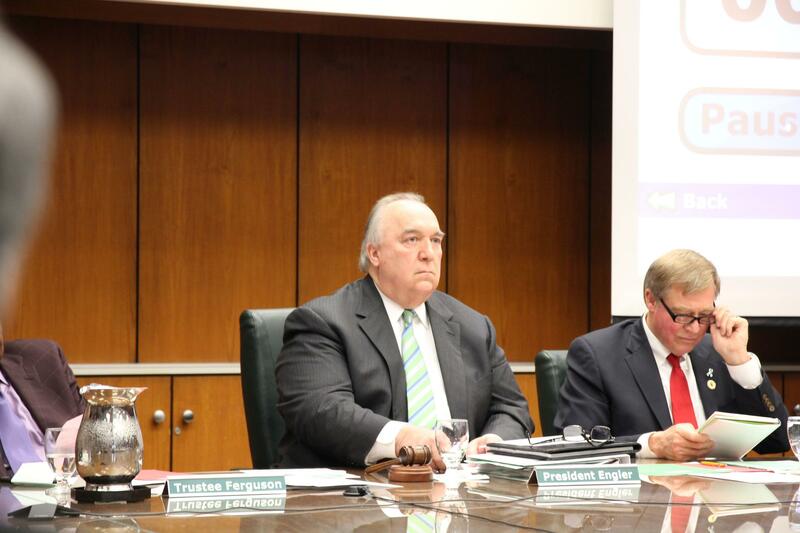 John Engler at an MSU trustees meeting last year. That’s apparently when the AG’s office saw photos of Engler at an MSU basketball game in East Lansing on March 9th – despite investigators saying they repeatedly confirmed with Engler’s attorney that his client wasn’t going to be in the state before late March. The interview for the 28th is off. As you know, our agreement to travel to DC to interview Mr. Engler was contingent on his representation that he would not be in the state of Michigan anytime in the near future. Later on Tuesday, Michigan Attorney General Dana Nessel sent a letter to MSU Board of Trustees Chair Dianne Byrum, complaining about Engler's conduct and asking Byrum to "demand that he participate" in an interview in Lansing within the next two weeks. For more than a year now, the Michigan Attorney General's office has been investigating how MSU handled the Larry Nassar sexual abuse case. That investigation has already resulted in several criminal prosecutions, including the case pending against former MSU President Lou Anna Simon. In Nessel's letter to Dianne Byrum on March 19th, the Attorney General talked about why interviewing Engler was so important to her office. "First, as interim President, Mr. Engler was hired to help stem the Nassar fallout. To do this, Mr. Engler publicly indicated that he had implemented several policy and staffing changes designed to address previously indentified deficiencies. These are relevant issues that fall within the very heart of our review. "Second, this office is investigating the concerning allegations that former Trustee George Perles resigned from his postion with the Board in exchange for the forgiveness of a debt that he owed. Mr. Engler is a critical witness in that investigation as well." Nessel's office had been trying to get a sit down with Engler for a while. In a letter to then-MSU attorney Bob Young dated January 24th, Attorney General Dana Nessel asked for the University's assistance in scheduling an interview with Engler, after his "abrupt" resignation on January 16th. Nessel said her office was subsequntly informed that "because Mr. Engler is no longer an employee of the University, the University cannot assist with facilitating his interview." Nessel disagreed. Engler's contract with MSU specifically requires him to "respond and provide information" in these instances and "'provide reasonable assistance to the University' in defense of any claims that may be made against it," she said in her letter to Bob Young. That meant MSU could not only facilitate an interview with Engler, Nessel wrote, but could "demand that he participate in it." Back to Tuesday, March 19th, when Assistant Attorney General Christina Grossi calls off the scheduled interview with Engler after seeing pictures of him at the basketball game. Later that same day, Engler's attorney, Seth Waxman, fired off a blistering response, saying Grossi was mischaracterizing their conversastions, and that he "never represented Mr. Engler would not be in Michigan between our last conversation and the 28th." In a formal letter, Waxman said that unless Grossi recuses herself from the investigation, he would advise Engler not to "participate in a voluntary interview with your office." "Your conduct diverges so drastically from the most basic principles of fairness, justice and what is right that you have undermined the integrity of your own investigation, which may be a result of your lack of experience handling criminal prosecutions (this being your first), let alone a high-profile criminal investigation," Waxman wrote in an email first reported by the Detroit Free Press. Engler has always been willing to cooperate with the AG's office, Waxman said, and Grossi's "decision to cancel his interview is most surprising." "Your outrage about Mr. Engler’s travels is similarly surprising and misplaced," Waxman added. "Since early February 2019, I have been communicating with you about making Mr. Engler available for a voluntary interview. At no time did I represent that Mr. Engler would not travel to Michigan as we discussed scheduling. Mr. Engler owns a home in Michigan. He has family in Michigan. It stands to reason that he would and does travel to Michigan when his schedule permits doing so. There has been no effort to hide that on two occasions Mr. Engler traveled to Michigan on weekends to see Michigan State University basketball games. Yet, you scurrilously allege that Mr. Engler somehow acted improperly by attending those events, as if he attended in disguise." “The Attorney General’s Office (‘AG’) does not consider Engler a ‘target’ or ‘subject’ of the investigation. “AG has no current information that Engler has engaged in any illegal conduct or done anything wrong. “AG views Engler only as a person who may have information about others (i.e., a witness). “AG believes that Engler may not even rise to be a witness because Engler may not have any relevant information whatsoever. In response, Grossi pointed to previous emails where she referenced investigators’ understanding that Engler wasn’t going to be in the state before late March. On March 4th, Grossi mentioned her concerns that Engler might be trying to “forum shop” so he wouldn’t be “subject to the same laws and restrictions as the other individuals that have sat for interviews by our team." On March 8th, Grossi again referenced her belief that Engler wasn’t going to be in Michigan until late March. “We have extended several courtesies to Mr. Engler already, including offering to fly out-of-state to interview him based on his representation that he won’t be returning to Michigan anytime soon,” Grossi wrote in that email to Waxman. Waxman did not immediately respond to Michigan Radio’s request for comment. MSU Trustee Brian Mosallam said if Engler won’t cooperate with the AG’s office, the board should stop paying his legal bills. “If Engler continues to evade the AG and not comply then we as a board should pull his indemnification,” Mossallam said in a written statement. Indemnification is the university policy where the school will foot a current or former employee’s legal costs for anything related to their work at MSU. Asked how much money MSU has spent so far on Engler’s legal bills since his resignation, University spokeswoman Emily Guerrant did not immediately respond with an answer. Reporter's note: this story has been corrected to fix a punctuation error and the spelling of MSU Trustee Brian Mosallam's name. It was originally mispelled as "Mossallam."